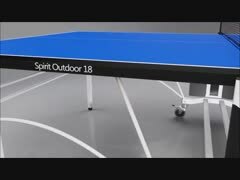 The Butterfly Spirit 18 Outdoor Rollaway is part of Butterfly’s new range (launched for 2016). The 18mm thick top which is made using treated plywood provides a very good bounce (but it does mean the table weighs in at 133 kg) To store you simply remove the net and post set and then each half is folded using one catch. The thick metal legs are adjustable for levelling and the package includes 2 bats, 3 balls and a cover.